I am so happy they love each other so much... At least while they are sleeping, anyway. 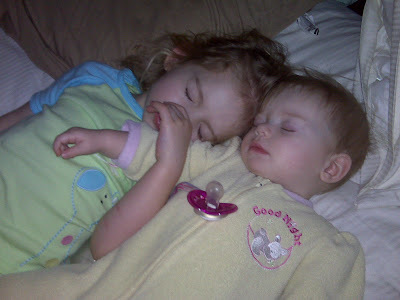 And, for what it's worth, although they are both in my bed (I finally gave up around 4 a.m. and let them come in - I had walked Addi back to her room twice) Addi does NOT have a paci. At least I'm sticking with one of the rules.